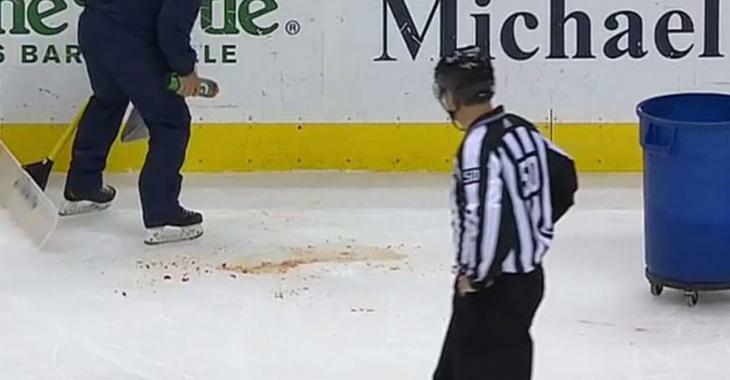 NHL News : Junior player loses his upper lip after getting slap shot in the face! Junior player loses his upper lip after getting slap shot in the face! You keep thinking only NHLers are tough sons of a gun, but the players are their way to the professional ranks are too. Just ask poor blue liner Simon Lavigne of the Armada of Blainville-Boisbriand in the QMJHL. On Friday night, the Armada was hoisting the Oceanic of Rimouski and things got ugly fast when Lavigne got a slap shot right in the face during the second period. According to many tweets from Quebecois journalists on site for the contest, Lavigne got up and managed to head back to the team's dressing room, leaving a pool of blood behind. The most gruesome detail given by Melissa who attended the game is that a referee picked up the upper lip of Lavigne that obviously was lacerated by the shot. He picked it off the ice and brought it to the Armada's trainer. She is adamant that the poor defender lost his upper lip on the play... Wow! According to Melissa, what the referee picked up weren't teeth and players from the Oceanic's bench were clearly mimicking a lip injury, pointing at their lips to get the attention of the trainers or officials. On the play as Lavigne laid motionless on the ice, Oceanic's Alexis Lafreniere, who recently returned from the World Juniors where he represented Canada, scored a controversial goal, seeing that Lavigne was hurt on the play. The goal however stood as poor Lavigne was helped off the ice. Players on the bench were reportedly mortified to see Lavigne's injury. Makes sense if the guy lost a lip! No additional details have been given on the young defenseman's condition. UPDATE: We finally have a short update on Lavigne, from a journalist and not from a fan on site. According to Vincent Demuy of ParlonsJunior, Lavigne lost two teeth on the play and that's what was picked up by the referee. While the teeth were brought back to Lavigne, there is no additional details on his condition at the moment. However, once again according to Demuy, Lavigne was not back in action: he is believed to be undergoing the concussion protocol.